We had a latter entry time this year for this event at around 5pm so there was no need for an early morning meet up. 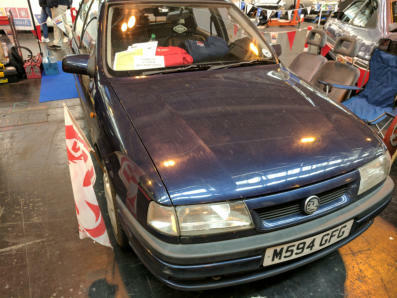 Phil Scaiffe arrived first in his Vauxhall Cavalier Mk3 1.7 TD Diplomat Hatch at the meeting point just outside the Premier Inn at the NEC where we would be staying, I arrived second in my Vauxhall Cavalier Mk3 2.0 SRi 16v Hatch. This was not going into the show but being used to ferry the club stand into the Hall. Richard and Beth Watt arrived a little latter with their Vauxhall Cavalier Mk1 1.6 GL “Custard”. A while latter Alan Wells arrived which is Opel Manta GT/E Exclusive with Club Member Martin Holloway following in his BMW. Once we had checked into our hotel we made our way around to the holding area for our hall. Though we were meant to enter the hall at 5pm we did not until around 6.30/7.00pm due to a couple of problems in the hall. We were photographed by Practical Classics on the way around to the Hall. Once in the Hall like a well-oiled machine the Club stand was setup. By this time, it was 9pm and we made our way back to the hotel, there was then a dash to the local Asda to get supplies for the next day. Friday arrived and we made our way on foot from the Premier Inn to the NEC Complex, about a 15min walk. Once inside we made some minor adjustments to the stand before the public arrived. Alan and Martin set about finishing off Alan’s Opel Manta. This car had undergone a restoration in the lead up to the event and only passed an MOT on the Tuesday. As you will know from the previous newsletter the car took part in the 1991 Lombard RAC Rally in one of the lower classes. Alan and Martin set about on the Friday removing the sunroof and finding a new rubber to seal it with. Meanwhile Phil had started removing the trim inside the boot of his Vauxhall Cavalier Mk3. He had had some rust repairs carried out on the car and wanted to treat the inside of the car and leave to dry overnight. Richard was carrying out some minor TLC to his Vauxhall Cavalier Mk1 1.6 GL “Custard”. During the day, we had a steady flow of people to come to the stand and had two new members join both with Cavalier Mk3’s. David Simster from Classic Car Weekly visited the stand on the Friday, he had a car on display in another hall. This is the first time this show has been 3 days and like the November Classic Motor Show Friday is more a Press Day. Emma Dodds from Club Sponsor Footman James visited the stand on the Friday. The show finished and we headed back to our Hotel for the night. Saturday arrived and there was a bit of drizzle in the air but this soon cleared and did not dampen our spirits for the day ahead. Alan and Martin set to work on refitting the body kit to Alans Opel Manta. Not an easy job but being inside the NEC with space and good lights helped. Phil finished off the works to his boot putting all the trim back on, he then replaced the worn back seats with better condition leather ones, and with assistance from me removed the front seats ready for replacement on the Sunday. He also went off and sourced some sound deadening. 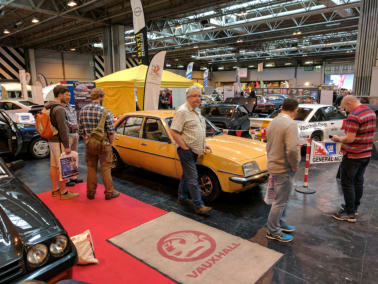 David Brown from Classic Car Weekly visited the stand on the Saturday and took pictures of Alan and Martin working on the Opel Manta which appeared in the following weeks Classic Car Weekly. 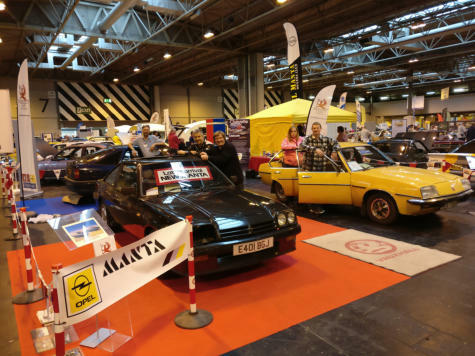 Club Member Daryl Keen visited the stand on the Saturday and had a good look over Alan’s Opel Manta. Friend of the Club Ian Kimpton also visited. Saturday came to an end and we headed for our Hotel, Saturday night those of use stopping at the Hotel headed out to Resort World at the NEC to have something to eat. Then we had a an amusing taxi ride back to the Hotel and bearing in mind we had to be up early the next day had a quick drink in the bar before heading to bed. 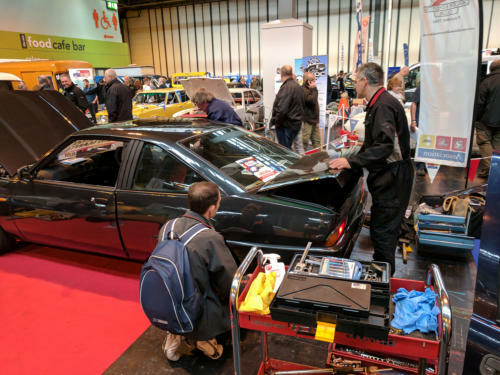 Sunday the final day of the show arrived and Alan and Martin set to work on the tricky job of putting the decals on Alan’s Opel Manta and sourcing and fitting a new aerial in the front wing. 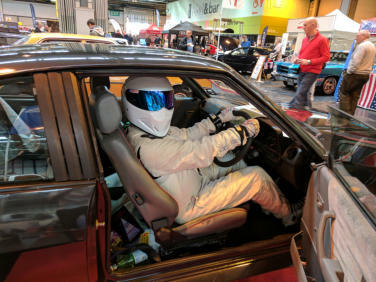 The Stig visited the stand on the Sunday and stood for a picture with Alan’s Opel Manta and the he sat in the car as well. Phil mean while his seats were removed had a look at what the car was like in the foot well. Mk3 Cavalier’s have some sound deadening here which can get damp. Phil removed this and it was damp and there were some rust areas which he treated and some welding which needed to be done at a latter day. With assistance from myself he swapped the seat bases over and fitted the new seats into the car. Club Members Dave Boon and Fred Coombs visited the stand on the Sunday. Richard on Sunday treated his Cavalier Mk1 “Custard” to a complete polish. The end of the show came on Sunday with the customary sound of car horns. 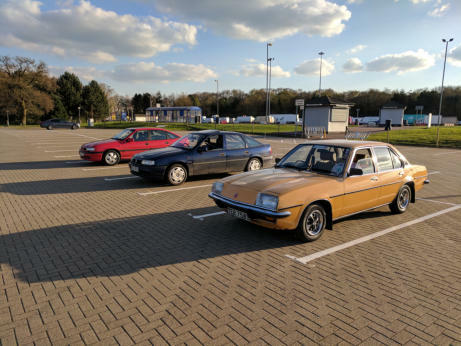 We packed the stand in top Phil’s Cavalier Mk3 and partly into Richard’s Cavalier Mk1 and headed for the car park to split items between the two cars and mine. The Sun was shining as we made our ways home. Kevin Bricknall (602) Thanks to Alan Well, Richard Watt, Phil Scaiffe for providing their cars for this event and Martin Holloway, Helen Holloway, Beth Watt for helping on the stand. Thanks to the following Club Members for visiting the stand. Darrell Keen, Fred Coombs, Dave Boon. Apologies if I have missed anyone.